I can’t begin to tell you how exciting my Thursdays have become. Once they used to be just like any other day; another one to get through before Friday arrived. NOW my first job of the morning is to make soup or a smoothie from whatever is starting to go a bit floppy in the vegetable rack and dust of my vegetable box, ready to leave in the porch for Abel and Cole to collect. But it’s not so much the collection of the empty box that fills my Thursdays with delight, no it’s the fact that in return, I am left with a FULL new box bursting with organic goodness. 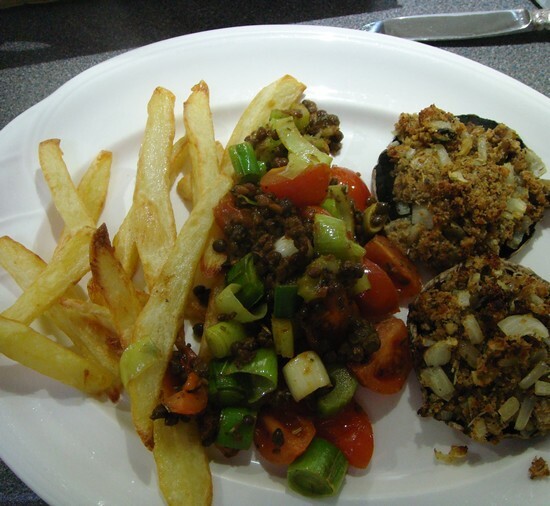 And here’s what I did with some of the ingredients, I whizzed up our favourite stuffed mushrooms recipe and gently fried the celery, leek, tomatoes to make a kind of ratatouille which I added puy lentils to. I was going to serve with healthy steamed potatoes, but home made chips won the vote! What about you? What would you have done with some of the lovely organic ingredients I received this week?